The dimensions and features section provides the ability to capture dimensions and features, by selecting them in the SOLIDWORKS feature tree or in the graphics area. 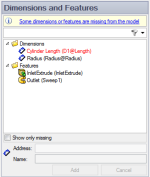 When any captured parameter is selected from the capture assistant, the parameter will be highlighted on the model and/or in the SOLIDWORKS feature manager. Selecting any captured parameter on the model or SOLIDWORKS feature manager will highlight the reference in the DriveWorks capture assistant. Dimensions - will be highlighted on the model only. Features - will be highlighted on the model and the SOLIDWORKS feature manager. Instances - will be highlighted on the model and the SOLIDWORKS feature manager. This feature is particularly useful when controlling Instances. The instance order in the SOLIDWORKS feature manager does not necessarily follow the order DriveWorks recognizes. In the image below Flange <5> in the SOLIDWORKS feature manager is Instance 1 to DriveWorks. 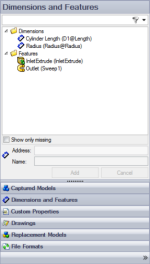 In this example Captured Parameter Highlighting indicates the instance parameter in the DriveWorks capture assistant, on the model AND in the SOLIDWORKS feature manager. Double click the feature or sketch which contains the dimension to capture. Select the dimension in the SOLIDWORKS graphics area. The address box in the dimensions and features section is filled in with the dimension's full SOLIDWORKS name. If the dimension still has its default name, e.g. D1, then you need to fill in the Name text box manually to give the dimension a meaningful name. If you've already named your dimensions in SOLIDWORKS, then DriveWorks will automatically fill in the Name text box for you. While capturing dimensions, it is often easier to disable Instant 3D/2D so that you can select the dimension text, if you don't, you will only be able to select a dimension by clicking the non-text parts of the dimension. Right click the dimension in the dimensions and features section. Ctrl or Shift select the dimensions to be removed in the dimensions and features section. Right click one of the dimensions. If you remove a dimension and save your group, the action cannot be undone. Furthermore, if you have already created any rules for the removed dimension, then they will be lost. Before removing a dimension, you may wish to make a copy of your group and projects. If you rename a dimension in SOLIDWORKS, the dimension will appear in red in the dimensions and features section. 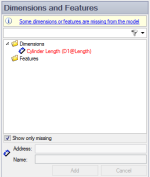 Select the missing dimension in the dimensions and features section. Double click the feature or sketch which contains the dimension that was renamed. Select the dimension to be renamed in the dimensions and features section. Change the name in the Name text box. Single click the feature in the feature tree. The address box in the dimensions and features section is filled in with the feature's SOLIDWORKS name. If the feature still has its default name, e.g. Shell1, then you need to fill in the Name text box manually to give the feature a meaningful name. If you've already named your features in SOLIDWORKS, then DriveWorks will automatically fill in the Name text box for you. Most items that are listed in the SOLIDWORKS feature manager can have its state (suppress/unsuppress/delete) controlled by DriveWorks. Select the feature from the SOLIDWORKS feature manager and if the name of the feature appears in the Address field of the Dimensions and Features tab it can be controlled. Right click the feature in the dimensions and features section. Ctrl or Shift select the features to be removed in the dimensions and features section. Right click one of the features. If you remove a feature and save your group, the action cannot be undone. Furthermore, if you have already created any rules for the removed feature, then they will be lost. Before removing a feature, you may wish to make a copy of your group and projects. If you rename a feature in SOLIDWORKS, the feature will appear in red in the dimensions and features section. Select the missing feature in the dimensions and features section. Single click the feature that was renamed. Select the feature to be renamed in the dimensions and features section. Some features also have Advanced Feature Parameters that can be captured. This offers greater control over the captured feature. The table below lists the types of features that can be controlled.